Rosie is 6 months old now and I can’t imagine how I managed to live without her! She’s such a beautiful baby and Laryssa has been wonderful since before Rosie was born and since we’ve had her, the very best contact. I couldn’t recommend her highly enough! I’ve had dogs all my life and have loved them all but this little baby Rosie is very, very special! 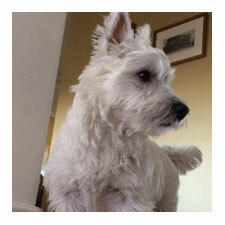 I always knew West Highland Terrier was the dog for me. I just needed to wait until the point in my life where I could bring a dog home. This gave me a lot of time to research! When I was finally ready to take the plunge my research brought me to Cedar Creek Kennels. I could not be more happy that I found them! Haggis is now 6 months old and the absolute best puppy in the world! He has a wonderful temperament, loves all people and dogs. He is great with kids, and endlessly patient with my 1 year old nephew who loves to give him ‘gentle’ pets and hugs. My entire neighbourhood adores Haggis and on a near daily basis strangers come up to tell me how much they love seeing my puppy walk by and how sweet and adorable he is! (They’re not wrong!) 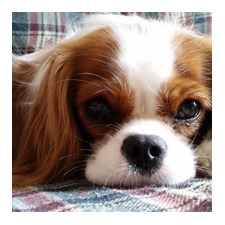 Cedar Creek Kennels take great care to ensure their puppies are healthy and well socialized and this makes such a difference in the dogs they will become! Thank you Laryssa and Cedar Creek Kennels for Haggis. I love this dog! 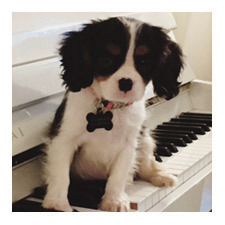 “Nearly a year has passed since I adopted my cavalier puppy from you. Penny is all grown up now! Seems like it wasn’t that long ago that I brought her home, then the next thing I know she was spayed, and then she was celebrating her 1st birthday, and now it’s almost been a full year. She has been such a pleasure to have, and I am so blessed to have her as my own and watch her grow over the year. She is definitely one of the best things that has happened to me, and I can’t express how much I love her and how much joy she has brought me. After deciding as a family to go ahead and find a dog the would suit our experience as dog owners (limited), our next direction was to find a breeder. Our research brought us to Cedar Creek Kennels. We were nervous at first. All your reassurance and advice proved extremely helpful. He (Brodie) was everything we had hoped for. We can’t thank you enough for giving Brodie to us. We are all so in love with him. He’s such a great dog and has brought so much love to our family. He was easy to train and has such a great character. We absolutely adore him. 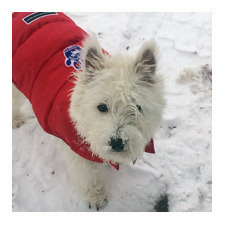 Our Westie (Brodie) has become one of us. P.S. I think he loves us too. With great appreciation and thanks. 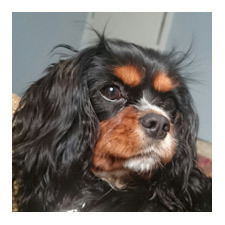 My husband and I always knew we wanted a dog to join our family, and after much research came upon the delightful Cavalier King Charles Spaniel. Once we had our hearts set on the breed, it was incredibly easy to find Laryssa and Cedar Creek Kennels as the responsible and kind breeder we were looking for. From the moment we contacted Laryssa until bringing Kylo home it was clear this was a breeder that loved these dogs (and treated them) like her own. We are so happy with our little guy- he came well socialized with a love of music and every kind of person imaginable. Thank you for this amazing dog, we can’t imagine our family without him. As a first-time dog parent, I wanted to be as certain as possible to choose the right breed and the right breeder. 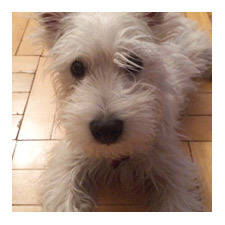 After settling on a West Highland Terrier, I did a lot of research to choose a breeder. Upon speaking with Laryssa, it was clear to me that she was knowledgeable, thoughtful, and committed to selecting good homes for the puppies. She brings up the puppies in a family environment and is very concerned for their health and wellbeing. 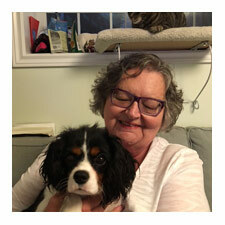 Our pup, Rufi, is an absolute joy – smart, funny, affectionate, active, and easy-going. He is also unbelievably beautiful. Our friends at the dog park were shocked to hear that he is only 10 months old as he is so calm and so responsive. He is very easy with my twelve-year old and plays happily with our cats, as well. We are already thinking about applying to Laryssa for another puppy as Ru has brought so much happiness to our home. I have no regrets at all about having him, and am not sure why I waited so long! 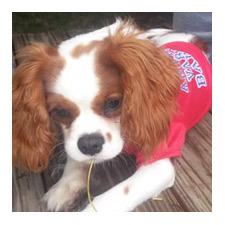 I would recommend Cedar Creek Kennels absolutely and, in fact, have done so already many times! Marty is the sweetest little dog you could ever imagine. His tail never stops wagging and he is the definition of our best little buddy. Inquisitive and intelligent, he wins everyone over with his bright smiling chops and jaunty gait. 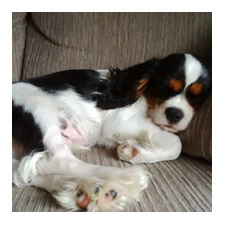 He loves every dog and person he meets, and is very responsive to training. We can’t picture our lives without him!